My Best Lawn Aerator Shoes Help To Make My Grass Healthy. Why I need the manual lawn aerators? At the side of my house is a strip of grass that needed to be aerated. Instead of renting an aerator for that small area, I decided to take care of it myself manually. While mowing the lawn I planned to wear spike aerators on my shoes. Then to finish up, I wanted to use a coring aerator. But first, I needed to find out which is the best lawn aerators for me to use. I’d like to share with you what I discovered in this buyer’s guide. I’ll begin with the shoes I selected. The spiked aerator shoes from Rockrok are a top-selling new product. After researching various aerating shoes, I chose these as the best ones for my yard. One of the main reasons I selected the Rockrok aerator shoes is because they are a little easier to adjust than the Punchau aerator shoes I’ll describe below. They have slots in the perfect places for the straps to fit my shoes, and other members of my family can wear them, too. The metal buckles are also comfortable to open and close. After buying the shoes, I had to assemble them, but that only took a few minutes. 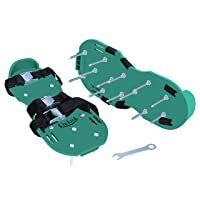 They come with a small wrench, or you can use your own crescent wrench to tighten the nuts that hold the spikes on the shoes. Once the spikes are on, then you can mount the straps in the best slots to fit your shoes. The metal spikes are two inches long. As Rockrok points out in their product description, the spikes penetrate deep enough to kill grubs. That’s the main power of aerating shoes. The spikes don’t do as good a job of aerating the soil as a core aerator does, although they can help de-thatch. I can see how they help when it’s time to fertilize the lawn, too. The holes they open up allow the fertilizer to sink in better. Walking in the shoes isn’t easy at first. The three-strap design keeps them firmly in place, so they feel stiff. But like I mentioned, the buckles are easy to release when you need to step out of them to enter the house. I found that it helps the shoes work better if the ground is moist, like after rain or watering the lawn. It’s also a good idea to keep a stick handy to scrape excess soil off the shoes. So far, the shoes seem sturdy and have held up well. In case there is a problem, Rockrok offers an 18-month guarantee on them. Besides the Rockrok shoes I chose, there is another best-selling brand I’d like to tell you about below. The Punchau Lawn Aerator Shoes are similar to the Rockrok sandals. 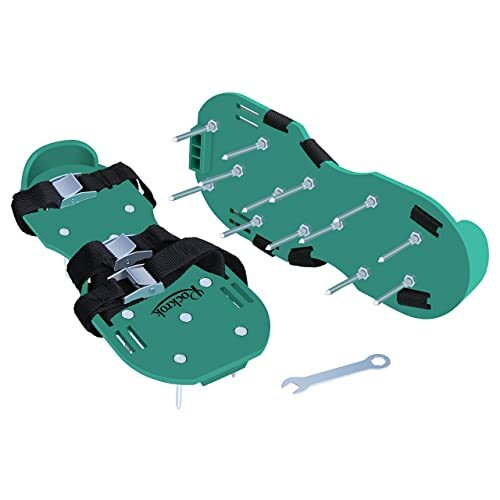 Each offers 2-inch spikes and three adjustable straps to secure their bases to your shoes. These shoes need to be assembled just like the others described above. The spikes should be mounted to the base first. There is a wrench included in the box so you can tighten the nuts that secure the spikes. Then you can mount the straps. You may find that the straps are too long, but they can be trimmed and the ends melted with a lighter so they don’t fray. I didn’t like the straps and buckles as much on these shoes, and I was glad to have purchased the Rockrok sandals instead. The buckles were a little more difficult to open and adjust. To help my lawn be as healthy as possible, I also bought a coring aerator. I’d like to tell you about it below. Although the spiked shoes help the grass by killing grubs and allowing fertilizer and water to reach deeper into the soil, I wanted a coring aerator to finish the job properly. A coring aerator opens larger, deeper holes. This is needed in areas where the ground is very compacted, especially where my family walks on it a lot. The Yard Butler ID-6C Coring Aerator is exactly what I wanted. It has a very sturdy steel frame with padded handles. The two coring tubes penetrate about 3 inches into the ground. The bar above the tubes is large enough for me to place my foot to push the aerator down into the soil. Manual aeration is hard work even if the lawn is well-watered. The coring tubes do occasionally clog with dirt. I keep a thin stick with me to clean out the clogs. But this aerator did exactly what it was supposed to do. Now the ground along the side of the house is softer and I’m excited to see the grass growing thicker. One last thing I liked about this coring aerator is that Yard Butler offers a lifetime warranty on it which tells me they believe in the quality of their product. Now that I’ve shared with you about the highlights of these helpful yard tools I found, I’d like to tell you about how I came to choose these particular ones. 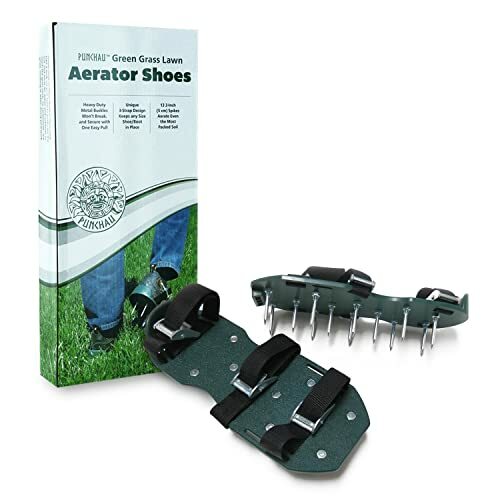 While I was researching to find my best aerator shoes and manual lawn aerator tools, I developed a short list of the criteria that would help me decide which ones were the best for me. First off, manual lawn aeration isn’t easy to do, so I knew I needed sturdy and strong tools that would stand up to regular use in hard, compacted soil. I didn’t want something that would break after only a few uses. Second, I looked for aerators that are simple to use because I didn’t want to spend time learning special techniques. I wanted to combine aeration into my regular lawn care routine. Finally, I wanted at least 2-inch penetration into the soil because that would kill grubs and better help the grass access nutrients and water. If you’re looking for a simple way to aerate your lawn or garden without using a power aerator, these yard tools will get the job done for you. 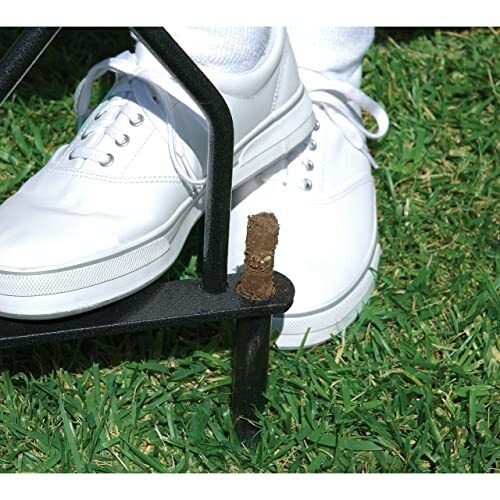 The Rockrok Lawn Aerator Shoes and Yard Butler Coring Aerator are helping my lawn look healthier already. It is hard work to use them, but they help me care for a small area that would otherwise be neglected. I’d like to restate here why I chose them. Rockrok Lawn Aerator Shoes open up 2-inch deep holes in the soil as I walk with them across my grass. This kills grubs and allows water and nutrients to reach deeper into the lawn. They securely fit my shoes as well as the shoes of other family members who have worn them to help me care for the yard. The Punchau Lawn Aerator Shoes are very similar to the Rockrok shoes with their sturdy spiked soles and 3-strap design. They also penetrate the soil to aerate the lawn. If you want to combine aerating with other tasks like mowing the lawn, get either the Rockrok or Punchau spiked shoes. The Yard Butler Coring Aerator is a strong steel tool with padded handles. Its two metal tubes dig deeper into the ground for the best aeration of the compacted soil. If you have areas that are especially hard and compacted, or you want deeper aeration, get the Yard Butler Coring Aerator. Thank you for reading this buyer’s guide. I hope that it helps you choose the best manual lawn aeration tools for your yard and garden. Please take a look at our other reviews of top products that will help you create a safe and comfortable home for you and your family.